“Hunter, destroyer, and keeper of ancient knowledge; I am nature’s answer to the rising power of man.”—Allailai, Killoren Ancient. A newly risen race of powerful Fey, the Killoren blend Nature’s patience and power with the ambition and aggression of the Humanoid races. The ancient places of the world stir with a power of their own. From this power, the Killoren have sprung in answer to the growing might of the Humanoid races. Whether the work of some great nature deity or the spontaneous creation of the wild power of Nature itself, the Killoren are at once young and eternal, newly brought to the world but with unknowable ancient ties to the heart of Nature. As Fey, the Killoren have a tie to Nature unmatched by the Humanoid races; unlike other Fey, Killoren are not content to wait in the dark recesses of the dwindling forests. 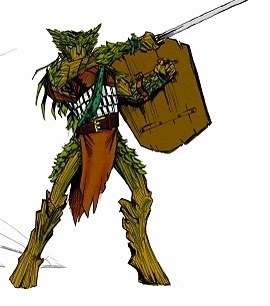 The Killoren are aggressive, ambitious manifestations of Nature’s presence and power, and they walk through the cities of Man as easily as they meditate in the glades of a verdant forest. There are as yet few Killoren in the world compared to the population of Humans and other Humanoid races, but their numbers are quickly growing. So far, these adaptable Fey have only come into isolated conflict with evil powers bent on despoiling Nature, but it is obvious they are destined for more. The Killoren have begun to make known their presence in the world, and a few far-seeing and learnéd sages wonder at the implications of their growing power and numbers. All Killoren constantly manifest an aspect of nature's might—the Killoren have no neutral, non-aspect state. All Killoren are born manifesting one of three aspects, usually the aspect their mother is manifesting at the time. The three aspects are Aspect of the Ancient, Aspect of the Destroyer, and Aspect of the Hunter. One the Killoren has matured, she is able to control which aspect she takes. Personality The Killoren have an innate connection to Nature’s power; as such, the natural world and its best interests are never far from their thoughts. All Killoren have three general sides to their personality, somewhat dependant on what aspect they are manifesting at the time. Not truly three distinct personalities, nevertheless, most Killoren have three ways of looking at things: contemplatively, directly, or dubiously. In this way, Killoren differ from other races in that they have three different aspects of their personality that correspond with their ability to manifest different aspects of Nature’s might. Killoren who manifest the Aspect of the Destroyer are arrogant and aggressive, those who manifest the Aspect of the Hunter are stealthy and subtle, and those who manifest the Aspect of the Ancient think carefully and look deep into the heart of a matter before voicing their thoughts. All of this combines with a Killoren's natural curiosity and ambition, and their desire to learn about and make their place in the world of the older races. Aspect of the Ancient Hair turns white and eyes turn to the colour of a blue summer sky. Aspect of the Destroyer Hair and eyes turn a deep, lustreless black; many find the gaze of a Killoren destroyer’s coal-black eyes to be unnerving. Aspect of the Hunter Hair and eyes turn a deep forest green, and skin tone becomes a deeper brown than when manifesting one of the other aspects. Relations Killoren are as yet a young race, and as such most other races do not even recognize them as anything more than strange-looking Elves (other than Elves, of course). That said, most allies of Nature who recognize them would be on friendly terms. Racially, Dwarves often find their inquisitiveness and connection to Nature grating, but appreciate their ambition and drive, even if it is directed at strange things. Gnomes and Halflings often find themselves on wonderful terms with Killoren, as they are similarly curious. Elves may see the Killoren as young and naive, if they recognize them at all, though there are many who are afraid that they may represent a Nature that is becoming more aggressive. Humans, Half-Elves, and Half-Orcs will often feel the most similarity to the Killoren, as they share their ambition and drive, as well as being varied both culturally and individually—the half-blooded races in particular would have a greater understanding of the duality of the Killorens' existence. Alignment The Killoren share a strong connection to nature, and it often guides their decisions. However, it does not dominate them as it does other fey, and they possess the ability to be of any alignment. Though they tend more toward Chaotic Good, Killoren of all alignments exist. Lands As of yet, the Killoren are few in number, and have yet to truly claim any lands of their own. Most live in villages hidden within the forest, in harmony with their surroundings. However, a few ambitious groups may already be starting to claim guardianship over larger areas, and begin to form small nations. Society Killoren seldom have a structured hierarchy as most other races do, typically deferring to the wisdom of their elders. However, in larger communities, and in the few kingdoms that are slowly forming, an especially ambitious and powerful Killoren, young or old, may be able to take a central leadership position. In most cases, the leaders of either organization will be a Druid, though exceptions to this norm exist. Religion Few Killoren worship in the sense the other races do. For them, Nature is their god, and they are filled with its powers in their many manifestations. However, in their quest to understand the older races, some may take up the worship of a Human or Elven deity, typically, though not necessarily, one with ties to Nature. Most, however, are drawn to the reverence of natural forces. Language Killoren speak Sylvan, the language of the fey, as well as Common. Many will try and learn other languages as well. Names Killoren have only one name, and they choose this name themselves upon declaring their own maturity, usually near the beginning of their tenth year of life. Killoren names always have three syllables, the last of which denotes their family in the same way that a human’s family name shows his or her relation. Examples Killoren names include Durmindin, Ennimbel, Kettenbar, Shallahai, Corenathin, Jerambul, Harmandel, Kitukel, Malindel, and Fardelmai . Adventurers The Killoren adventure to learn about the world. Unlike other Fey, the Killoren are driven by the nameless powers of Nature to learn about the Humanoid races and customs. Killoren match the aggression and ambition of Humanoids, but they also maintain the eternal connection to Nature that all Fey embody. As the Killoren grow in power and number, they form ever-changing opinions of Humans and their allies, helping the causes that they deem to be one with Nature’s design and opposing those who would despoil or destroy Nature’s beauty. Experienced Killoren might adventure with a more definite purpose—working to thwart the schemes of a particular religious cult, protecting Nature from wild Orcs and Goblinoids, or hunting powerful outsiders that are beyond the reach of Nature’s other servants. Origins In most settings, Killoren are created as a means of learning about the Humanoid world in ways not normally open to their Creators, be they the Gods and Goddesses of Nature or Fey Lords. This sets them apart from other Fey, turning them into something of outcasts in the Fey realms—much in the way Elves are in some settings, but where Elves are simply 'fallen' Fey, the Killoren were actively created as such. Ageing and Death Killoren do not age as other races age. Most reach maturity by the age of ten, the Aspects of Nature helping them to grow and mature faster. After they reach this age, however, their growing will slow considerably. Most do not show signs of ageing until they pass the age of 100, and no-one knows how long a Killoren might truly live. It is therefore believed that the Killoren are immortal, dying only from accident or violence, but are only active for the first few of centuries of life. After this time, their sense of time begins to expand onto a geological scale and they become quintessential Nature spirits—sturdy as ancient mountains but still alive like mighty redwood trees. Generally, none choose to live past 150 years, opting to undergo a ritual of reincarnation, but there may well be those who have found a purpose too great to allow them to succumb to death. 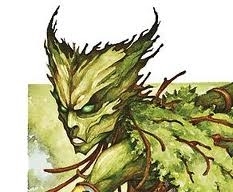 Favoured Classes Because of the nature of the connection between Nature and the Killoren, the Killoren favour the Primal classes—namely, Druid, Shaman, and Warden. Other common class choices include Ranger, Scout, and Bard. Racial Ability Adjustments: Killoren must choose a +2 racial ability adjustment in either their Wisdom, Dexterity, or Charisma at first level in addition to the racial ability adjustment, +2 Constitution. Vision: Low-light Vision. Killoren can see twice as far as a Human in starlight, moonlight, torchlight, and similar conditions of poor illumination. They retain the ability to distinguish colour and detail under these conditions. 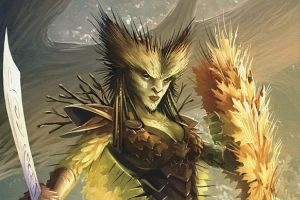 Bonus Languages: Aquan, Auran, Elven, Gnome, Ignan, Terran. Skill Bonuses: See Manifest Nature's Might. Fey: Killoren are of the Fey type and are therefore not affected by spells such as Charm Person and Hold Person. Unlike other Fey, Killoren gain Hit Dice only by acquiring levels in a character class. Immunity: Immunity to magic sleep effects. +2 racial bonus on saves against enchantment spells or effects. Racial Skills: Killoren have a +2 racial bonus on Handle Animal and Survival checks. Cold Iron Anathema (Su): Killoren have a difficult time wielding weapons made of cold iron. Killoren take a –4 penalty on any attack roll they make with a cold iron weapon or a weapon made only partially out of cold iron, such as a cold iron spear or a bow firing cold iron arrows. Killorean are vulnerable to cold iron weapons and take 1.5x dmg from cold iron weapons unless DR is active. Manifest Nature’s Might (Su): Killoren are forever bound to the raw forces of nature itself, manifesting this bond even in their physical form. A Killoren can only manifest one aspect of nature’s might at a time. Each morning as the sun rises, a Killoren spends 10 minutes in quiet meditation, filling her spirit with the aspect of nature that is most needed for her current tasks. Once a Killoren chooses an aspect, she manifests that aspect until the next morning, when she chooses again which aspect to manifest. Many Killoren favour one aspect over the others (usually determined by the 1st level ability adjustment chosen) and rarely choose to manifest one of the other two aspects. Each aspect offers particular benefits, including racial skill bonuses, and provides an associated encounter power. Your appearance and personality changes based on the aspect you are manifesting. Ability Adjustments: +2 Wis in addition to initial racial adjustments. With this bond to nature’s secret lore, a Killoren gains a racial bonus on Knowledge (Nature) checks equal to her Hit Dice and gains an additional +2 bonus on saving throws against enchantment effects. This bonus stacks with the Killoren’s normal racial bonus on saving throws against enchantment effects. Additionally, after 10 minutes of meditation, she can add her Wisdom Modifier to any Knowledge check made within those 10 minutes, whether or not it is a class skill. As you feel an external influence press upon your mind, you enter into an immediate, swift mediation and contemplate, fighting the invasion with the ancient secrets of your primal soul. Trigger: An enemy imposes the dazed, dominated, or stunned condition upon you. Effect: Make and immediate saving throw with your Wisdom modifier as a bonus to the roll to remove the triggering effect. Appearance: While a Killoren manifests the Aspect of the Ancient, the color seems to drain from her appearance as she turns white and her eyes turn to the colour of a blue summer sky. Wrath of Nature You channel the pure anger of the natural world toward those that are anathema to it.1/day, up to a maximum number of times per day equal to the character’s Charisma bonus (Minimum: 1), a Killoren can call out to the powers of Nature to aid her in her struggle. As a swift action, the Killoren chooses one target within sight to smite. The Killoren adds her Charisma bonus to her attack rolls and adds her hit dice to all damage rolls made against the target of her smite. In addition, while smite is in effect, the Killoren gains a deflection bonus equal to her Charisma modifier to her AC against attacks made by the target of the smite. This smite attack works only against aberrations, constructs, humanoids, oozes, outsiders, and undead. If a Killoren accidentally smites a creature that is not one of the creature types listed above, the smite has no effect, but the ability is still used up and counts against the total uses per day. If the smite is successful the target makes a fort save DC (10+ HD + Cha mod) or is stunned for 1 round. Appearance: While a Killoren manifests the Aspect of the Destroyer, her hair and eyes turn a deep, lustreless black; many find the gaze of a Killoren Destroyer’s coal-black eyes to be unnerving, and thus, she gains a +2 to intimidate. Your keen predatory instincts guide your attack to the most vulnerable of your prey's openings. Before the end of your next turn, you may re-roll any one damage roll on a target you have hit. Appearance: When a Killoren manifests the Aspect of the Hunter, her hair and eyes turn a deep forest green, and her skin tone becomes a deeper brown than when manifesting one of the other aspects. Male Names: Banmarden, Durmindin, Fiddenmar, Kettenbar, Midnorten, Rodmennar, Vennerzad.